The first test vehicle, delivered on September 23, 1940. The history of the jeep as interesting the vehicle itself. At the start of WW2, the US Army forsaw the need for a range or vehicles to support a motorised Army. 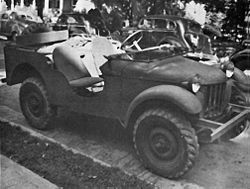 The first jeep prototype (the Bantam BRC) was built for the United States Army Quartermaster Corps (QMC) by American Bantam in Butler, Pennsylvania, followed by two other competing prototypes produced by Ford and Willys-Overland. The American Bantam Car Company actually built and designed the vehicle that first met the Army's criteria, but its engine did not meet the Army's torque requirements. 1,500 of each of the three models were then extensively field tested. During the bidding process for 16,000 "jeeps", Willys-Overland's chief engineer "Barney Roos made extensive design changes to meet a revised weight specification (a maximum of 2,175 lb, including oil and water). By July 1941, the War Department desired to standardize and decided to select a single manufacturer to supply them with the next order for another 16,000 vehicles. Willys won the contract mostly due to its more powerful engine (the "Go Devil") which soldiers raved about, and its lower cost and silhouette. Whatever better design features the Bantam and Ford entries had were then incorporated into the Willys car, moving it from an "A" designation to "B", thus the"MB" nomenclature. By October 1941, it became apparent Willys-Overland could not keep up with production demand and Ford was contracted to produce them as well. The Ford car was then designated GPW, with the "W" referring to the "Willys" licensed design. During World War II, Willys produced 363,000 Jeeps and Ford some 280,000.